The Waltons office has been based in Nottingham city centre for many years and we decided we wanted to give back to the local community. Stonebridge City Farm is a popular local attraction and charity. The farm is free to all visitors and provides places for children and families to have fun and learn. The farm needs charitable donations to stay afloat and we decided to give the farm a visit to see if there was anything we could do to help. The farm has a brick building which was formerly used for animal handling classes but it then became the location for children’s birthday parties. The animal handling classes had to stop because food for a children's party cannot be near farm animals. The farm was in desperate need of a covered animal handling space; bad weather in the autumn and winter often lead to classes being cancelled. We offered to help the farm and after a few meetings we all decided a log cabin would be the best option. A log cabin would be big enough to hold an animal handling class and would be comfortable to use all year round. As well as a log cabin the farm also needed a building to use as an information point. This would be useful for farm users so they can pick up leaflets about the farm and information about upcoming events. 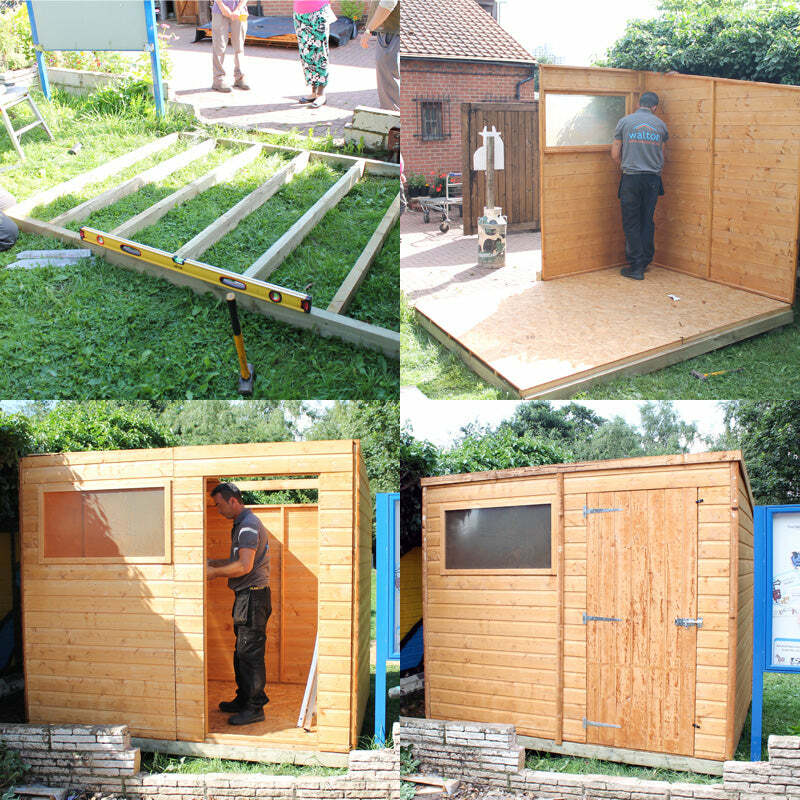 For this we chose the 8’x 6’ Waltons Tongue and Groove Pent Shed. This shed was perfect because it provided good space but would not block too many of the views on the farm. The log cabin area needed a flat, level base so the farm took a few weeks to sort this out. Once the base was built the construction date was set for the 8th and 9th of August. Waltons arranged for 3 installers to be there to build the log cabin. On the morning of the 8th of August the Waltons team and installation team were ready to go. The installation team brought the shed and log cabin with them. They instantly got to work and the log cabin was completed in one day! 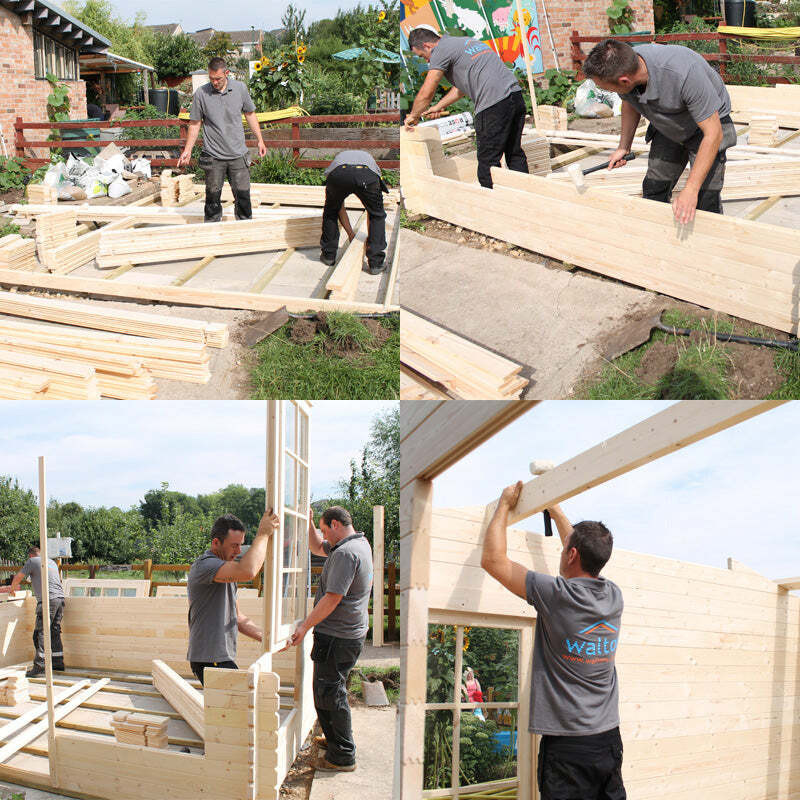 The following pictures show the construction of the log cabin; it shows how quickly the log cabin was completed. On the second day the installation team returned to the farm to complete the pent shed. The shed was put up very quickly and is now in the perfect position to use as an information point. The pent shed was placed on a Portabase so it could be easily installed on the farm. Stonebridge City Farm and Waltons is holding an official grand opening for ‘The Waltons Education Room’ and the new Stonebridge information shed. The opening day will take place on the 30th of August. The fun filled day will involve an official ribbon cutting ceremony, farm animals, a cow mascot and much more. Visit the farm's website for more information. If you're looking for high quality garden buildings check Waltons Garden Buildings.